Catamount Trail Running | Fit Families | Kids VT - small people, big ideas! Arriving at the Catamount Outdoor Family Center for a recent Tuesday night trail run felt like walking into a family picnic. Toddlers trundled along on balance bikes while their parents socialized. Giggling kids played tag on the grass. As the start time for the 2.5-kilometer Cadets race — geared toward kids ages 12 and under — approached, young runners donned athletic gear and bib numbers and headed to the starting line. After a short countdown, they took off with gusto, many accompanied by Mom or Dad. Spectators cheered on the runners as they snaked around a field, climbed a hill and entered the woods. Shortly after the Cadets departed, toddlers and beginning runners ages 8 and under lined up for the Cubbies race. The gaggle of adorable pint-size kids did a quick 200-meter loop while parents looked on. The last event of the evening was a 5-kilometer run for teenagers, adults and more experienced kids as young as 10. 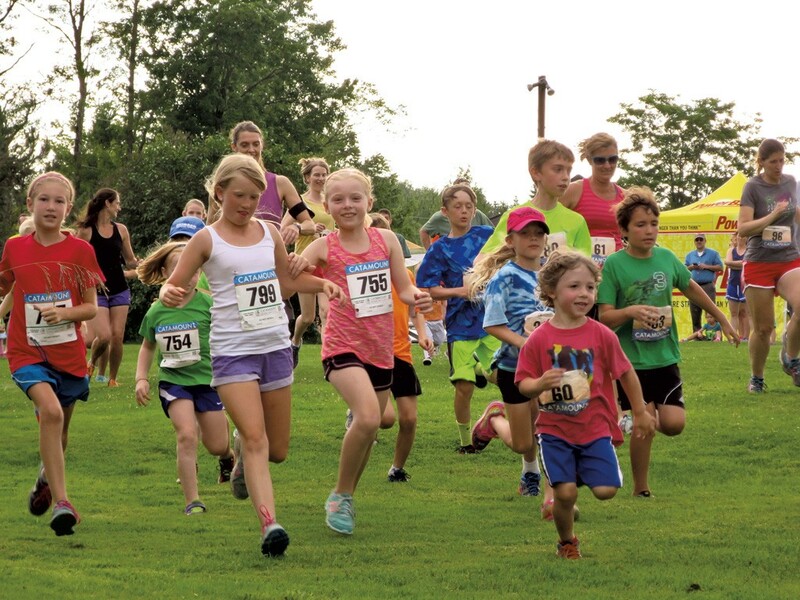 The Tuesday Night Trail Running Series, which takes place at Catamount every week from mid-May to mid-September, is a great way to introduce kids to the sport, said Catamount executive director Mike Stearns. Many young runners who started at Catamount have gone on to compete on high school and college track and cross-country teams, he added. Located just five miles from bustling Taft Corners in Williston, Catamount is an oasis of inviting woods and mountain views, with more than 20 miles of trails for walking, running and mountain biking. The land has been in the McCullough family for six generations, since 1873. The family still lives on the site, which is now managed by a nonprofit. The trail running series began in the early '90s; some families have been loyal participants for as long as they can remember. Six-year-old Kate Carlson from Jericho belongs to one such family. Her parents first ran at Catamount years ago as young adults. Now they frequent the series with their kids. Kate was 2 when she first participated in the Cubbies race. Last summer, she enjoyed the Cadets race so much that she set a goal to attend every week of the series this summer. Her 9-year-old brother, Taylor, runs with her, and their parents run the 5K course. Kate said that she loves how every time she runs at Catamount, there's a bit of surprise because the race rotates between three different courses. No matter the trail, the race is "always fun." Times and rankings for the Cadets and 5K races are posted online about three hours after the races conclude, which encourages runners to strive for their personal best, said Stearns. There's still room for sibling rivalry, though. Kate's mom, Jenn Carlson, joked that when Kate and her brother hit the trail, "the gloves come off. Arrive early. Tuesday Night Trail Running Series race registration begins at 4:30 p.m. at the Family Center. To eliminate pre-race jitters, leave plenty of time to get your bibs, warm up, head to the starting line and relax. Summer passes, available for individuals and families, are good for seasonal trail use, entrance to the trail running series and a bib for the whole season, eliminating the need to register each week. 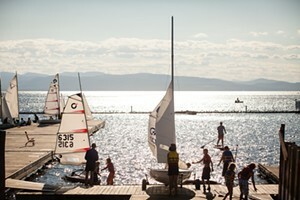 Visit catamount outdoorfamilycenter.com for prices. Dress for the occasion. Wear comfortable and breathable clothing and trail-running shoes for traction on muddy sections of the course. Stay hydrated. Water and restrooms are available on site. Bring the whole family. There's no minimum age for racing. Kids 7 and under in the Cadets race generally run alongside a parent or an older sibling. Stearns recommends that kids wait until they're at least 10 years old to run the 5K race.